Phil’s research has used ecological science and indigenous and local knowledge to interpret changes in demographic trends and abundance of wildlife populations (e.g. terrestrial and marine birds). The key focus of his research has been on climatic and anthropogenic (e.g. harvest) drivers of population change, and the development of models to forecast population trends. He has expertise in interpreting ecosystem structure and function within scientific and indigenous worldviews, in particular the ways that different cultures ‘sense’ the environment. Phil has experience interfacing both scientific and cultural frameworks to design and interpret biodiversity indicators for Māori resource users, scientists, policymakers, and government and non-government officials. Strong cross-cultural partnerships with indigenous people, especially Māori, are core to his research. Also of interest are the arrangements used by Māori and indigenous people internationally to achieve governance and management over their lands and natural resources. For the last decade, Phil has worked as part of national and international multidisciplinary teams, comprising ecologists, modellers, social scientists, and school teachers. Outcomes include amendments to government policy resulting in the re-establishment of a customary harvest of grey-faced petrel chicks; presentation of principles and priorities for the future governance and management of Te Urewera; and the restoration of coastal forest ecosystems using palaeo-pollen records and mātauranga. 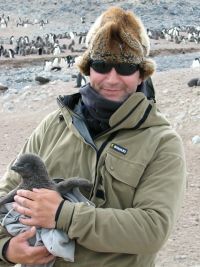 His results contribute significantly to understanding biodiversity and ecology in New Zealand and Antarctica, and have been communicated through international and national peer-reviewed journals and conferences, community newsletters, TV and print media, school journals, and the NCEA Year 10–13 Geography curriculum.